There are countless styles and designs of doors to choose from and even a slight difference in material or trim can make a huge difference to the environment and efficiency of your room. Unknown to many, there is a variety of basic designs to choose from when deciding which door is best for you. Usually the most common design of doors found in buildings around the world, swings doors consist of a handle which allows the door to open from the left or the right. This direction of opening can be customized to suit your personal preference and it’s highly recommend that you never place a swing door where it would be opened into a hall or corridor. One of the most up and coming styles of door, sliding doors are renowned for being a space-saving solution. Commonly used as cupboards or closet doors, sliding doors are increasingly becoming useful for interior room entrances, especially in rooms with limited space and also for adding a touch of elegant design and style to a room. Framed doors are also becoming a more and more popular choice in houses and buildings around the world. This style is most commonly found on glass doors, usually with a stylish aluminium frame that allows the door to stand out as well as maximizing lifespan and operating potential. Not only do these frames add strength to the doors structural integrity, framed glass doors are renowned for their luxurious and stylish appeal. There a few things to consider when choosing the right kind of door for you. With style and design set to the side, here is a list of points to follow to ensure the door you’re buying is perfect for the room you want it. How long would you like the life of your door to be? Is the door going to be used to conserve heat and energy of the room it’s attached to? Are you going to have to purchased other accessories such as hinges or brackets to mount your door? These are all points you need to think about when investing in a door. You may feel as though you can cut labour costs by taking on the project yourself but it’s worth remembering that fitting a door can be a stressful task to complete, especially if you don’t have the right tools such as levels that ensure the door is square in the frame. Size is always an important aspect to remember when purchasing a door. The majority of houses will originally have the same sized door frames but over time, thanks to ground movement and the structure of your building settling, these dimensions can vary from room to room which is why it’s so important to measure your frame before you buy. When in doubt, it’s highly recommended that you consult a professional. There are a vast range of materials to choose from when it comes to doors, each with it’s own advantages and disadvantages. However, the most common types of doors are made from wood or glass. Wood is easily the most common material used for doors as it’s renowned for its sturdy properties and traditional style however, doors made from glass and metal are rapidly replacing wooden doors thanks to their modern and sophisticated design as well as their abilities to effectively hold heat in a room, conserving energy and fantastic soundproofing advantages. Potentially the most overlooked aspect of any door, both interior or exterior, is soundproofing capabilities. All interior doors are given what is known as a STC rating, otherwise known as a Sound Transmission Class. The higher the class level, the less sound that is able to travel through the door. There are various ranges with a mid-range of around 40 and any door with a class over 60 should be virtually soundproof. Now you know what to look for when buying your next glass door, the question still remains; why should you purchase a glass door? This is a commonly exclaimed question, especially since wooden doors are so traditional but as mentioned above, glass doors are rapidly taking the place of wooden doors in all kinds of building environments. Perhaps the most obvious advantage of a glass door is the fact it’s made from glass. This allows for a dramatic increase in light to room. Not only does this visually fill your room with natural sunlight, reducing the need for artificial lights that once again conserves energy, but you are also able to maximise the potential use of space in your room. With a decreased level of shadows and dark spaces, you’ll be able to enjoy all areas of your room. Another one of the greatest benefits of having glass doors is the hygiene and cleanliness. 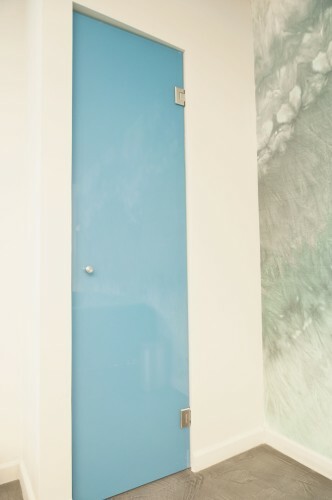 Unlike wooden doors, glass doors are immune against external forces such as woodworm and rot. To compliment the stylish appearance, glass doors also collect very little amounts of dust and can be easily cleaned with a quick wipe with a cloth and affordable glass cleaner. Due to the lack of dust and professional design, more and more offices and commercial properties are investing in glass doors as the way forward. With the recent advances in graphic design and printing, glass doors are becoming and more and more common sight in offices and other related commercial properties. These means that businesses can increase brand awareness with their customers by printing and applying clean graphics or other information to their glass doors or partitions. The obvious disadvantage of using glass doors is the durability of the door itself. Glass is famous for shattering or cracking in situations where a heavy blow may impact the door. Many glass door suppliers have avoided this issue by using reinforced aluminium frames that help increase the structural integrity of the doors as well as using specially designed reinforced glass which has been proved to be strong to withstand the impacts doors witness on a day to day basis. The other considerable drawback of using glass doors is privacy. It’s extremely rare for rooms such as bathrooms to have glass doors for this exact reason and, especially in commercial environments such as offices, you may want privacy in your office space in situations where you may be handling important data or conducting meetings with clients. Once again, glass doors suppliers have combatted this issue with the ability to offer frosted glass door solutions and, in some cases, even coloured glass, allowing rooms to still benefit from the advantages of natural light and a stylish appearance whilst increasing the level of privacy in the respective room. 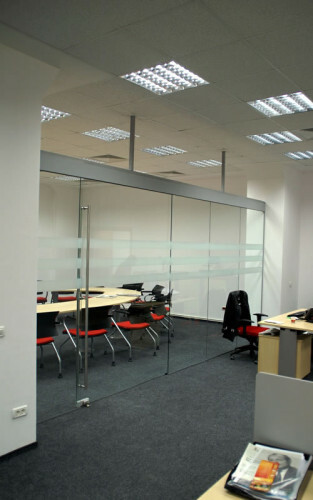 Glass doors are becoming more and more popular in commercial and domestic environments all around the world. With a huge range of designs, styles and functions, there is a glass door to suit every room, no matter the purpose. You can start enjoying the benefits of a glass door today by visiting Transparent Design and seeing how one of our friendly members of staff can help find and tailor a solution to suit you.